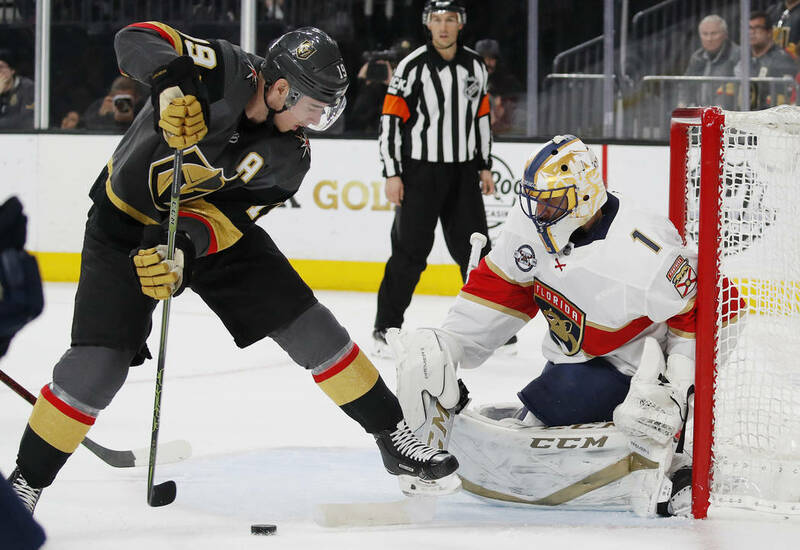 When the Golden Knights returned home Feb. 7, they had an 11-point lead over the fourth-place team in the Pacific Division and were set to play eight of their next nine games at T-Mobile Arena. A playoff spot seemed a foregone conclusion, and if they were going to gain ground on the division leaders, this was the time to do it. Instead, the Knights find themselves in an unexpected battle for third place. 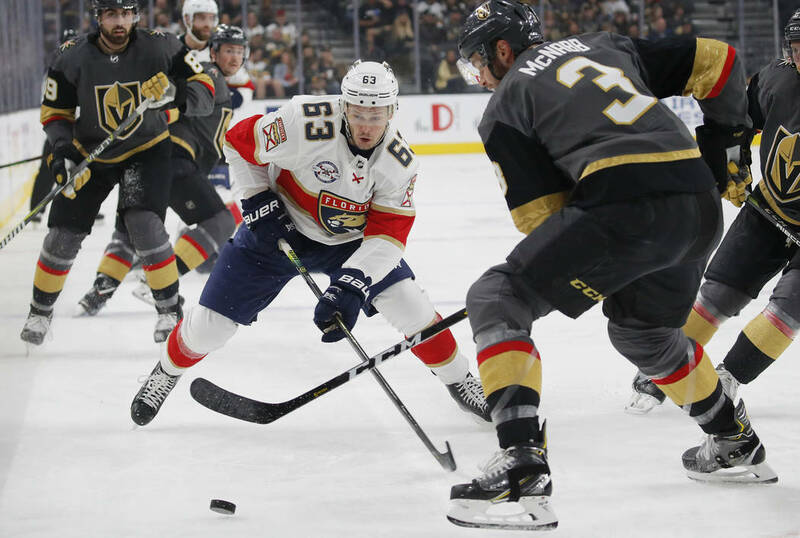 Reilly Smith scored two goals, including a between-the-legs tally in the second period, and Shea Theodore had the lone conversion in the shootout Thursday night to lift the Knights to a pivotal 6-5 victory over the Florida Panthers. 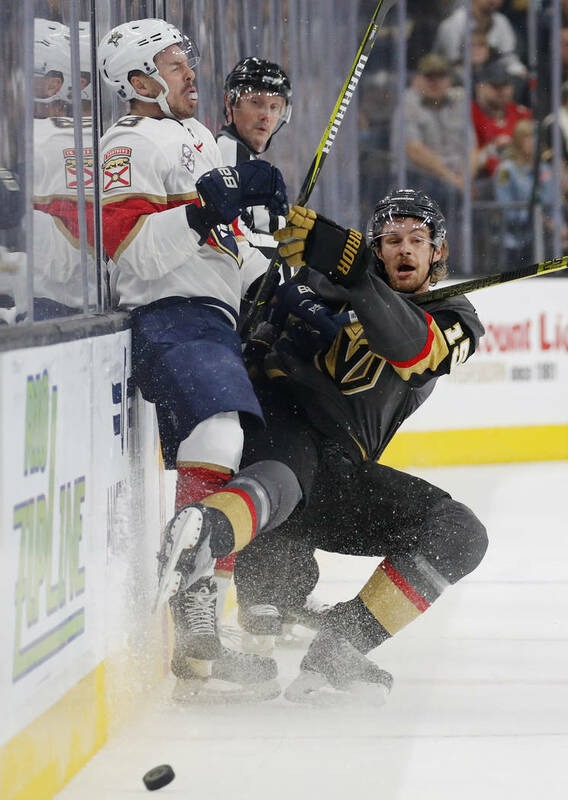 Jon Merrill and Paul Stastny each had a goal and an assist, and Theodore and Jonathan Marchessault added two assists each to help the Knights win their second straight. 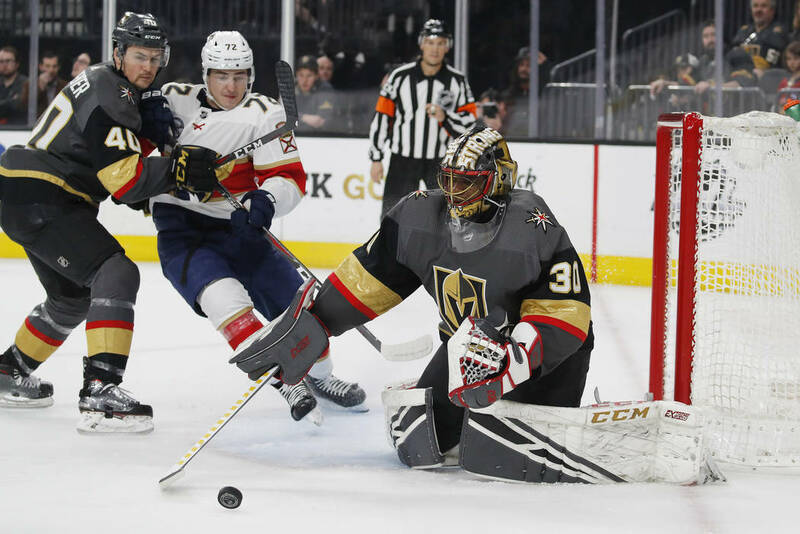 The Knights, who closed out a four-game homestand, went 3-4-1 at T-Mobile during February to see their lead over fourth-place Arizona sliced to six points. Malcolm Subban won for the fourth time in his past five starts and improved to 4-0 during his career in shootouts. He stopped all three attempts by the Panthers and has never allowed a shootout goal (16-for-16). The Knights were coming off one of their best performances in Tuesday’s 4-1 victory over Dallas. 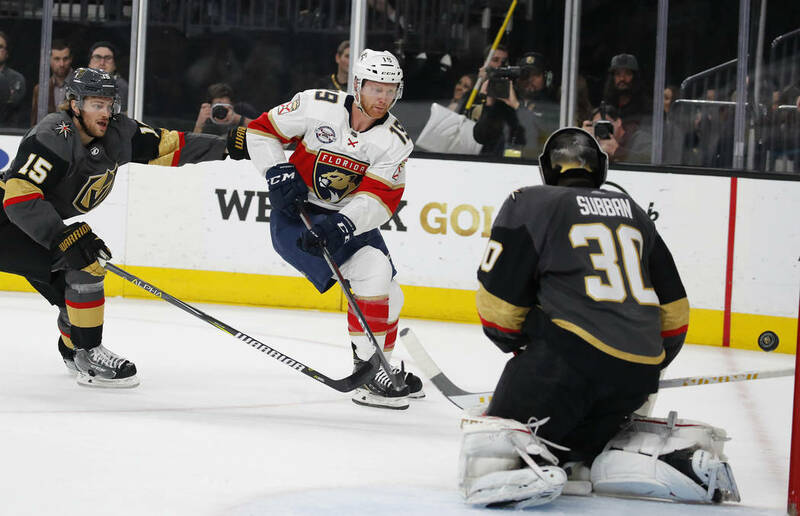 But they gave up two power-play goals in the first period to Florida and trailed 5-4 when Jonathan Huberdeau potted a rebound 3:18 into the third period for his fourth point of the game. But Smith, who had one goal in 2019 entering Thursday, put the Knights on his shoulders and made sure they earned at least one point for their effort. 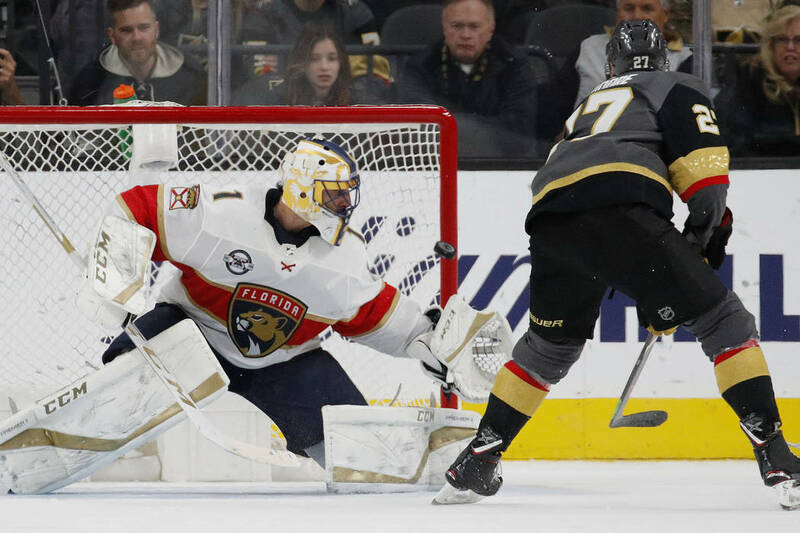 Smith flew down the left wing, and his shot deflected off the stick of Florida defenseman Mike Matheson and fluttered over goaltender Roberto Luongo’s shoulder for the tying goal with 4:18 remaining. Knights left wing Max Pacioretty had the best chance for either team in overtime when he rang a shot off the post with a little less than three minutes left in the extra session. Florida, which has points in seven of its past eight games (5-1-2), scored three goals in the final 5:26 of the first period to go up 3-1. 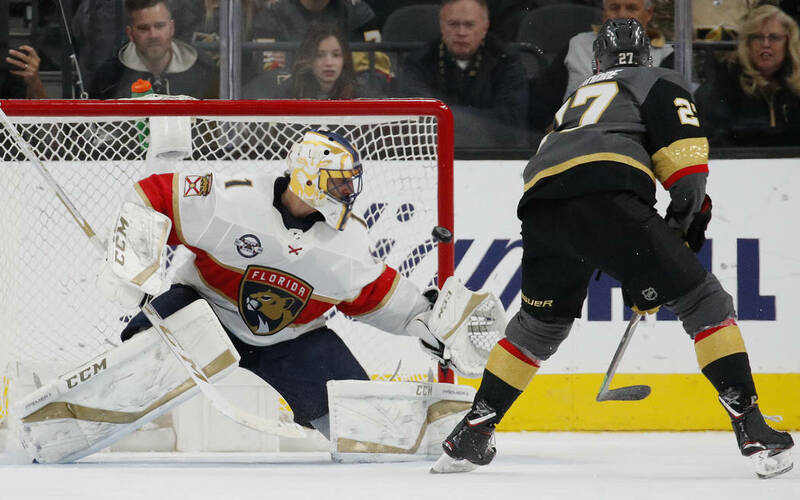 Smith made the score 3-2 with 12:20 remaining in the second when he took a pass in front of the net from Marchessault and tucked his stick between his legs before flipping the puck past Luongo. Merrill tied the score with 5:38 left in the second, and defenseman Colin Miller, who was a healthy scratch for two games in the past week, put the Knights ahead 4-3 with 3:50 to go in the period with his first goal since Nov. 24. 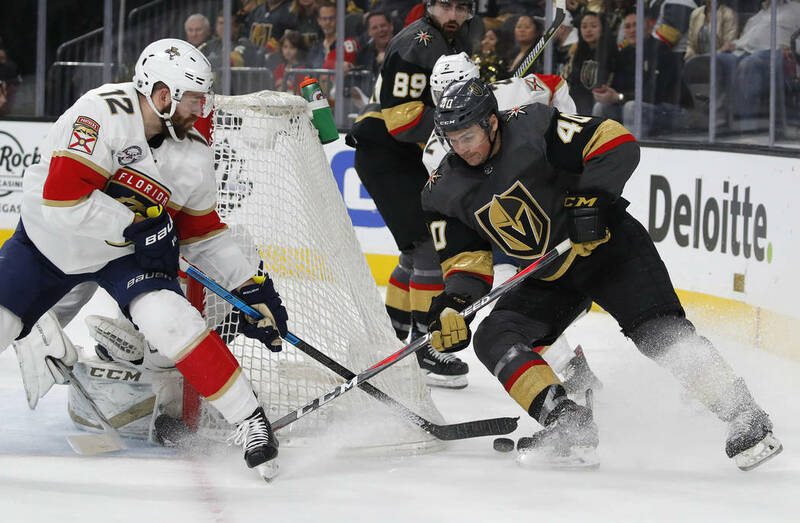 The Knights scored the opening goal for the second time in their past 12 games when Stastny tucked the puck through defenseman Keith Yandle’s skates after a faceoff and went high on Luongo for his eighth goal at 3:09 of the first period. But Florida answered with three unanswered goals, including two by Mike Hoffman on the power play. He tied the game at 1 with a shot from the right circle and netted his 30th goal from nearly the same spot with 1:29 remaining in the first. 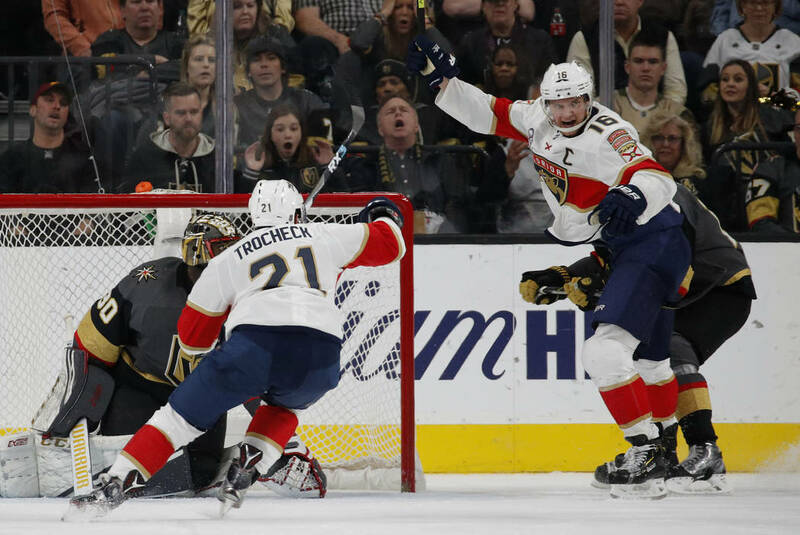 Vincent Trocheck gave the Panthers a 3-1 lead 28 seconds later when he tipped Aaron Ekblad’s drive from the point past Subban. 1. Radioactive. Two members of local rock band Imagine Dragons cranked the rally siren before the first period of Thursday’s game. The Knights lost four straight games in the Stanley Cup Final after the group played prior to Game 2, but finally lifted the curse. 2. Merrill’s milestones. Knights defenseman Jon Merrill scored in the second period to set a career high with his third goal. Merrill also picked up an assist on Reilly Smith’s goal to record his first two-point game with the Knights and the third of his career. He has 12 points, two shy of tying his career best set with New Jersey in 2014-15. 3. 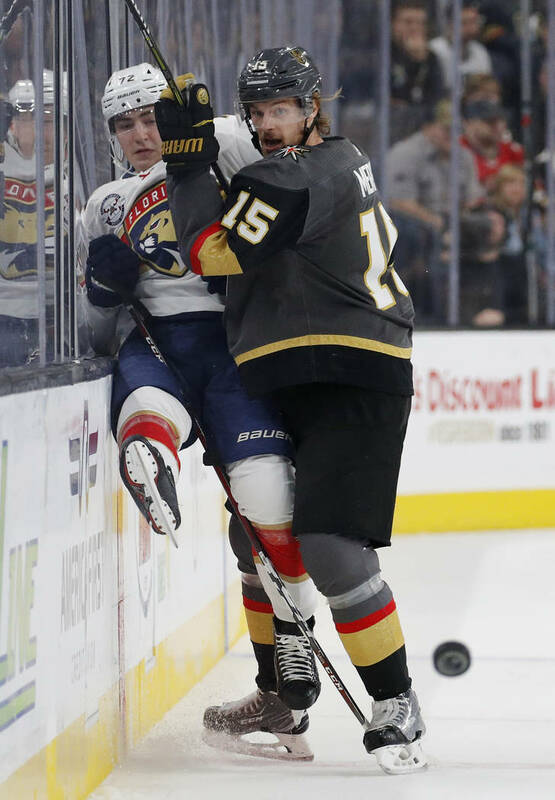 Active D. The Knights’ defensemen were a major part of the offense against Florida, as Merrill, Colin Miller, Shea Theodore and Nate Schmidt combined for two goals, four assists and 21 of their team’s 46 shots on goal.